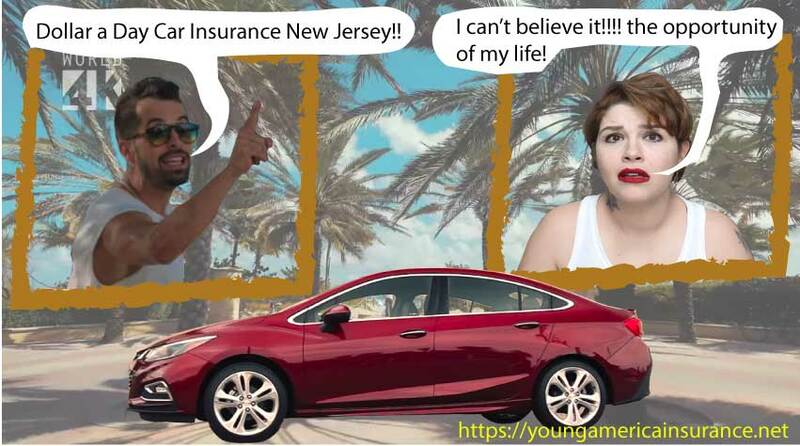 Dollar a Day Car Insurance New Jersey | Get it with us today! If you live in New Jersey and are on Medicaid, you can qualify for the Special Automobile Insurance Policy or SAIP. This residual government-backed coverage is widely known as dollar a day car insurance New Jersey, as the policy costs, are about $365 annually. A New Jersey SAIP plan will only pay out for severe medical injuries caused to the driver, as a result of a vehicular accident. It does not include liability insurance for injuries and damages sustained to others. Another important point is while this plan does provide New Jersey proof of auto insurance and allow legal insurance for the driver, it offers limited protection. In fact, NJ $1 dollar auto insurance does not even meet the state legal minimum liability coverage for most drivers. Those with assets to protect and expensive vehicles should consider a more comprehensive plan with higher limits. Keep in mind the SAIP program was specifically designed for New Jersey motorists that have low income, who often can’t afford auto insurance at all, or drive uninsured. The goal is to offer coverage to those drivers at rates they can afford, so they will be legally insured. Valid New Jersey Drivers License and registration. Drivers with suspended licenses will not qualify. Be currently uninsured in NJ. If you have auto insurance, then you are ineligible for the program. Be actively enrolled in Medicaid that also covers hospitalization. Note: if your Medicaid is canceled and you are no longer enrolled, your dollar a day coverage will stay valid until the policy renews. At that point, it is your responsibility to find alternative coverage. How to Buy NJ Dollar a day Auto Insurance: New Jersey residents can buy SAIP dollar-a-day coverage from most insurance agents throughout the state. This makes buying coverage as easy as contacting your local insurance agency. The National Continental Insurance Company underwrites the program, but you can get insured through most licensed agents and brokers. Medical Coverage limits to $250,000. This covers emergency room care, including advanced brain and spinal cord treatment. A $10,000 death payout. This is to be paid to your family members, in the event you die in a crash. This amount could cover funeral expenses or other urgent costs. Continual Medical Treatments. You will not be covered for medical care as a result of an accident if your injuries are non-spinal cord and non-brain related. One of the leading causes for U.S. bankruptcies are medical bills. Limited coverage can result in you being stuck with large hospital and rehabilitation bills that you can’t afford. You may be able to get most of the medical costs covered through Medicaid, but you will be alone in this tedious process. Legal Costs related to an accident. Property damage done to others, that resulted from an at-fault car accident you caused. Damage done to your personal property. This is regardless of who was responsible for causing the accident. Given the limited scope of a SAIP plan, it might be smart to get better coverage. Even for low-income drivers that qualify for dollar a day car insurance New Jersey, it might more sense to get a policy that provides greater protection. While SAIP is one of the cheapest policies you can buy at just $30 per month, it offers insufficient protection. It also doesn’t account for a person’s driving record or other variables that would lower rates with other types of policies. Basic NJ car insurance for safe drivers can be purchased for around $35 per month with much greater protection. Before you sign up for $1 New Jersey insurance, carefully weigh the pros and cons of the policy. Most drivers can get a basic liability policy in New Jersey with the state minimum levels of protection between $35 and $60 per month. That extended coverage could save you a lot, in the event you get into an at-fault crash. If you have multiple cars that need to be insured, SAIP will only cover one per policy. This can be an inconvenience that might make some hesitate about signing up. If you need dollar a day car insurance New Jersey, you should first check out rates from direct providers. You may be able to get better coverage for just a few more dollars per month. Apply now for a free quote and compare the lowest local NJ rates.